Our Work-Life Balance is What Makes Working at ReachMobi Great! In ReachMobi's mission to innovate and excel, we know that it takes the best team to get there. We also know a company is only as strong as its employees. We strive to create a work environment that is both challenging and rewarding, balancing work with life, and incentivizing our team members to feel motivated and appreciated. At ReachMobi, you can work in a relaxed but creatively stimulating atmosphere, where there is no dress code (sorry, but some clothing is required). We know the balance between work and life is essential. And while we work hard in a fast-paced environment at ReachMobi – we also decompress and play equally hard. Foremost, however, we understand the importance of recharging one's batteries and having fun. We know these are essential ingredients that actually help us to be more productive. To that end, we offer relaxation spaces, amenities and refreshments to help our staff unwind, reinvigorate, and emerge stronger than ever! What?!! Yes, you read that right – your eyes aren't deceiving you. We offer unlimited paid time off (PTO). As long as you are doing your job – take the time off that you need. Instead of tracking how much time you take off, we focus on how much you get done. At ReachMobi, we prefer that our employees have an ownership mentality, focusing on producing great results, rather than just making sure they've ticked off the requisite number of hours. We know that short breaks actually boost one's creativity – science says so – and we aren't going to argue with that! In our game room, you'll find a pool table, ping-pong, basketball, foosball, darts, video games and more. Perhaps you'll become our next in-house legend – it could happen! Those seeking a challenging career will find themselves more than satiated at ReachMobi. Nonetheless, mental stimulation and sense of purpose aside – the stomach needs food! And since everyone knows that Mondays are rough enough – a growling stomach isn't something we want getting in the way of progress. To that end – we provide free catered food every Monday. Repeat: Every Monday – free food. And when that midweek hump to get over arises on Wednesday – we've got your back… And your stomach, too! Free catered food again on Wednesday. In addition to the biweekly catering, our kitchen is loaded with free snacks: Every. Single. Day. And did we mention we've got cookies, too? Craft beers? Yeah, we've got that. Life doesn't revolve around optimizing conversions – there is also beer. We have a variety of perfectly chilled beverages waiting for you in our in-house beer fridge. A family, team atmosphere is what we cultivate at ReachMobi. "Team" outings are a regular occurrence. 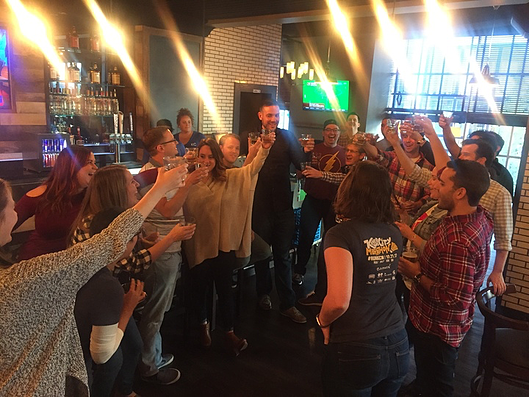 In addition to visiting local pubs and eateries, and taking in happy hour, we also go on various field trips. We take our team to watch our other favorite team: The Kansas City Royals. We also do other fun things, such as trivia contests and more. We're always looking for another reason we can legitimize celebrating, and if it comes right down to it – we'll make one up! Sure, productivity is a requirement here – but so is fun. While we're kicking booty, optimizing, innovating and all that – we're also laughing all the way! (Jingle bells optional). Catered Lunch x2: We provide and pick up the tab on lunch two times per week. Chair Massages: Get that stress rubbed right out of your neck and shoulders. In-House Gym: Work out before work, during your lunch break, or after work. Heck, even work out while you work (whistling optional). I know, I know… We've just made it harder for you to use the excuse: "I didn't have time to go to the gym." Your gym is right here. Silly contests: To keep work fun, we have a number of silly contests going on regularly. Bring your pet to work day: We designate a special day for bringing your beloved pet to keep you company. Let your favorite furry friend (or scaly friend?) discover where you go when you disappear for several hours each day. 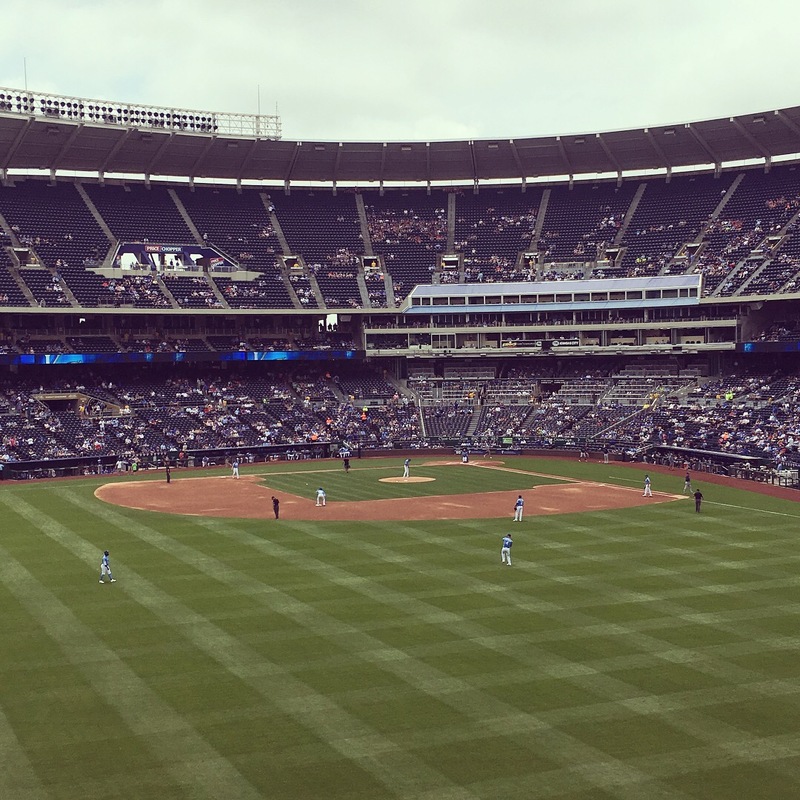 Discount tickets for local sporting events: Whether it's the Royals, Chiefs, KC Sporting – being a member of the ReachMobi team will nab you a discount. Local shopping deals and opportunities: You'll get discounts to a number of local establishments and other opportunities. Check out our Gallery page to see what we've been up to lately! Are you ready to join ReachMobi's team? We're now hiring awesome people! 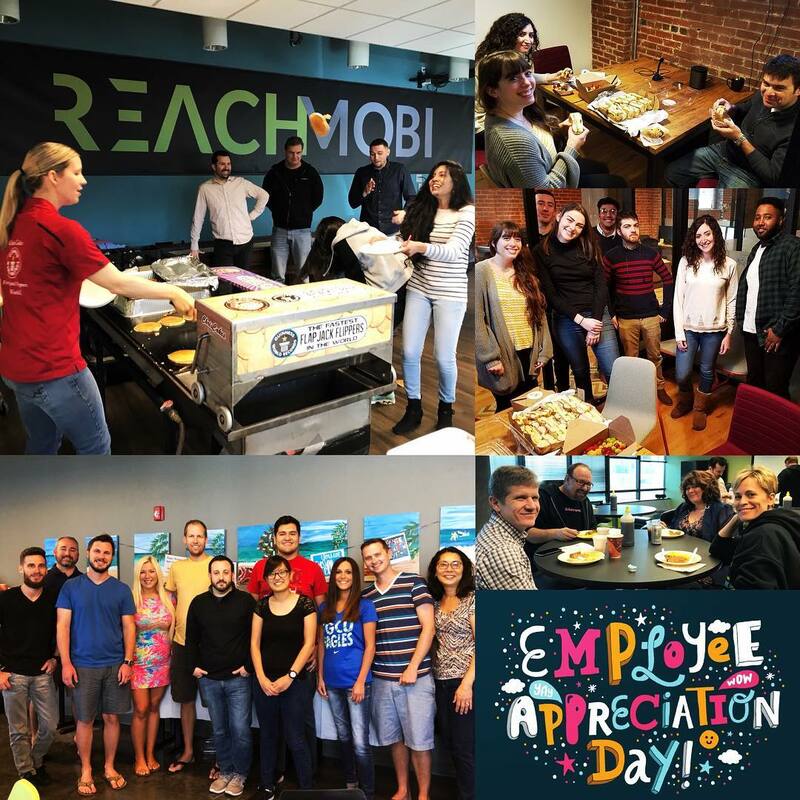 Check out our careers page and see what opportunities are awaiting you at ReachMobi! There’s lots of energy going around at ReachMobi. We live in a fast-paced environment here, but we also know that recharging our..